An online protest against the surveillance programs of the U.S. National Security Agency planned for July 4 was off to a slow start Thursday morning, despite expectations it would see participation from thousands of websites. 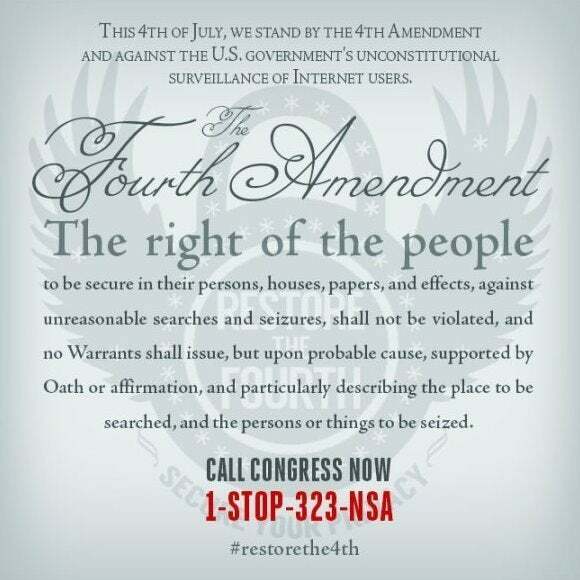 The action is part of a larger movement called Restore the Fourth—a reference to the Fourth Amendment to the U.S. Constitution—that is also expected to include live protests in dozens of cities across the U.S. Organizations who are part of the Internet Defense League, a loose coalition committed to defending Internet freedom, were expected to participate in the July 4 online protest by displaying a message against "NSA spying" on their websites using a banner or a modal window. However, as of 8 a.m. Eastern Time, only a few of the high-profile Internet Defense League supporting websites were showing the protest message. Many of the participating websites belonged to civil rights organizations. They included 4chan, The Electronic Frontier Foundation, O'Reilly Media, Piwik, Free Press, Accessnow.org, and ColorOfChange.org. There were no protest messages at that time on other high-traffic websites better positioned to raise awareness about the action, including Mozilla, Reddit, Imgur, Fark, DuckDuckGo, Cheezburger.com, and Wordpress.org, despite their listing by Internet Defense League organizers as participants. Mozilla has been particularly critical of the U.S. government's surveillance efforts following the recent revelations in the media about the NSA's data collection programs. The organization launched a website called StopWatching.us in order to gather signatures from users demanding that the U.S. Congress reveal the full extent of the programs. Mozilla did not immediately respond to a request for comment regarding its expected participation in Thursday's online protest. Website owners who wish to participate in the protest can add the code provided by the Internet Defense League on their websites, the protest organizers said. The league also recommended spreading the word using social media, posting images on blogs, calling or emailing Congressional representatives, or joining the street protests.